This post is all about tips on how to make a long-distance relationship last. Long distance relationships are NOT easy and can often leave you wondering if it’s even worth it. You never get to see them, you’re running out of things to talk about, AND you guys are starting to fight about the stupidest things. BUT, you know it’s worth sticking it out through this hard time because soon before you know it you will be back together for good. Plus, you love him and could never see yourself with anyone else. Long distance relationships don’t always work, but there’s a constant theme for the ones that do last through all those hard times. Here are 5 common tips on how to make a long-distance relationship last that will take your rocky relationship into one that is better than it has ever been. 1. They make it a priority to talk on the phone every day. Life always manages to be busy and a lot of days fly by without you even knowing what you did. However, putting aside at least five minutes to talk to your boyfriend and ask him about his day is a crucial part of still feeling like you’re apart of his life even when you are miles away from each other. I have been in a long distance relationship for two years, and I know first hand that the same old conversation gets boring. You begin hearing the same thing every single day so switch it up every once in awhile and think of some deep questions to ask your boyfriend. Ask about his future plans, the next vacation he wants to go on, what movie he wants to see next, etc. OR, plan the next date you are going to go on when you are together. While texting each other is better than nothing (and sometimes all you can do! ), successful long distance relationships make it a priority to talk on the phone or Facetime to really discuss what is happening in each other’s lives. 2. Spontaneously tell each other that you love them. It is really easy to not feel like you are important when you are miles away from your boyfriend (and vice versa). When you are close to each other it is so much easier to be able to show how much you appreciate them. But, when you’re long distance, there is only so much you can do. A simple surprise text here and there throughout the week can show your significant other that even though are you far away from each other, they are SO important to you. A simple reminder text on just how much they mean to you can make someone feel so special and brighten there day. Your partner should never have to question how much you care about them and a simple “I love you” or “I am thinking about you” sent occasionally could change the whole dynamic of your relationship. 3. They are 100% truthful to each other. This is the hardest part about long distance relationships. You basically live two separate lives. The life you live when he is with you and the life you live when he is gone. It is especially difficult when you are in college because they are constantly meeting new people you don’t know (or trust) and going out at night. The most successful relationships tell each other everything so that when one of you is out at night, the other one has complete trust that they are being faithful. This also goes with the fact that if there is an issue that is bothering you, they NEED to know. Being petty from miles away isn’t as effective because most of the time they cant tell you’re being petty and take the hint! You have to be way more straightforward about the issues that you are feeling. 4. Their relationship is one of their top priorities. This is a key to all successful relationships but especially so of long-distance ones. Like I said before, life can get really busy and you can forget to put your relationship as number one. Make time for each other and plan special things that you can enjoy even far away. A personal favorite of mine is a Facetime date. Both of you go get your favorite takeout at the same time, eat it “together”, and then go watch one of your favorite shows or movies. You could also plan when you will see each other next, what you will do, places to explore, etc. Just that “date night” feel will make it seem like you aren’t so far away. 5. And (debatably) the most important…Keep that spark alive! You are both adults and let’s be real, adults like to hook up. A surprise text keeps him on his toes and will remind him what he has waiting for him when you’re together. 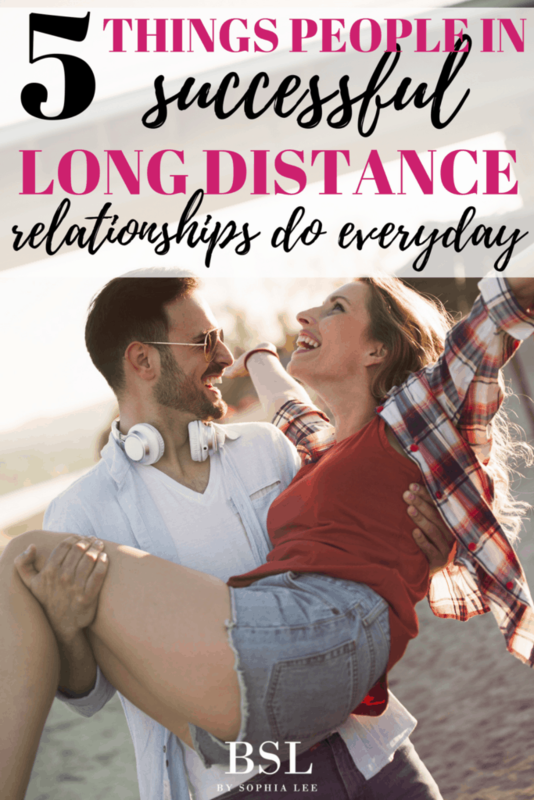 All in all, long-distance relationships have a lot of hurdles to get through but these are five common themes that every successful long distance relationship does. This post showed you tips on how to make your long-distance relationship last. What keeps your relationship exciting? That is genius!! Never thought about doing a countdown app but I’m going to download one right now! Skyping is seriously a lifesaver in long distance relationships… makes it feel a little more “normal”!